Showing results for tags 'bluebelle'. Ho boy, this was always awkward. Not that she didn't enjoy these times it was just...still very awkward. Bluebelle and her mother always had an...'interesting' relationship, she wasn't a bad mother, just a tad overprotective and had been all of the mule's life. Having homeschooled her and 'protected' her from the world....most likely for the sake of her social circles....but Bluebelle didn't mind. She was a kind mother that loved her in the end and the rest of her family on her mother's side were equally loving. 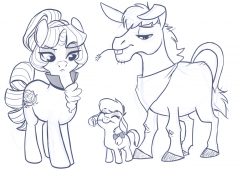 Especially her dear cousin in Ponyville, Bramble Rose - Oh, that reminded her, she'd have to pop by at some point. Or send a card. Whatever was easier during the holidays. Speaking of which, Canterlot was done to the nines as always during this season. Decorations, the warm smell of festive food being flooded out from the cafe's, it was such a different place compared to Appleloosa...she'd almost forgotten what snow looked like with so much time out in the desert. It had its own beauty but this place was practically picturesque! She finally had a reason to wear the thick scarf and booties that her mother had INSISTED upon her when she'd left for her own. So with breath showing in the air and a slight hop in her step, she made her way down the streets of Canterlot, retracing the steps she took in her mind as her eyes drifted over every shop, every house and every decorated lamplight. Feels so nice to be home. She thought to herself. 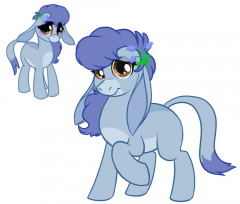 Another Old vs New, this time of Bluebelle the Mule/Molly. Bluebelle's family. Consisting of; Gilded Rose - the snobby Canterlot Unicorn. Wheatgnaw - Her gardener/donkey grounds keeper. And ofcourse, a tiny Bluebelle, trying to make her mum happy. My Little Pony: Nostalgia is Magic. The original "Mane Six" in that they were, at one time, the ONLY 6. 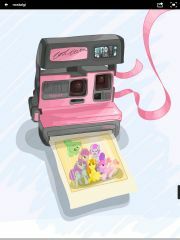 The original My Little Ponies in a photo taken with the ultimate of 80s cameras... The pink and grey Polaroid "Cool Cam". The hairstyles are all actually based on people or characters from that time period, mostly from the Facts of Life. Butterscotch's hair is Cyndi Lauper's from the "She's so Unusual" cover, toned down a bit.